For my first topic I thought of picking swept wings .The reason for doing this is that the advantages the swept wings have to offer as compared to any other wings are tremendous and have always captivated me. This is also the very same reason why most airplanes use the swept wings configuration . Swept wings may be forward swept or backward swept .The wings which you will find on most commercial planes are backward swept.Swept wings provide wonderful static and dynamic stability and also delays drag divergence mach numbers from being reached at various parts of the plane (will be discussed later ) and thus reduce drag by preventing shock wave formation . Now if you consider simple aerodynamics you will know that any body kept inclined to free stream velocity will offer lesser drag than the one kept normal to it .So also is the case with swept wings and thus one can save on the extra thrust due to reduced drag and also increase fuel saving along with increased flight time . In the case of a crosswind coming and affecting your flight path by turning it in the longitudinal plane in a conventional non-swept wing configuration aircraft, you would alter the camber of the rudder to counteract this undesirable motion. However in swept wings,due to their tendency of returning to their original direction (static stability), the flight will do so without the pilot having to use the rudder .The reason for this is that when you yaw, the inner wings will be further inclined to the free stream of air but the outer wings will now be normal to the free stream of air. Thus the drag on the outer side will be more compared to that of the inner side and as a result the plane will now align itself back to the original position . Just like dihedrals, swept wings also give you roll stability i.e. when the plane is rotated by external undesirable forces along the horizontal axis by small amounts, the wings produce disproportionate lift & become horizontal again . This is actually happens because the normal flow of air over the lower wings has greater velocity than that on the upper wings. This in turn is mainly because of greater sideslip velocity of air over the upper wings (try to work it out with a vector).Thus the lower wings produce more lift than the upper wings and the plane rolls back to original position . Now induced drag is basically vortex formation at the wing tips which disrupts air flow . The greater the lift at the tips, the greater will be the magnitude of the vortex and more will be the drag the airplane offers. 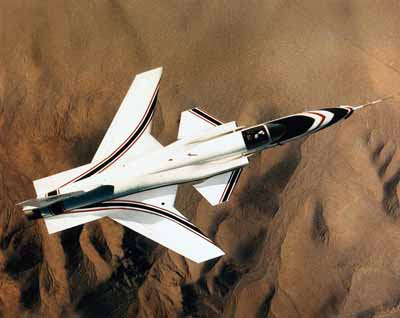 Now most of the swept wings are formed by giving a taper like cut to the normal wing . This increase the span efficiency factor (e) . Theories suggest that greater is the span efficency factor (it basically implies to elliptical pattern of lift production wherein max lift is at root and dies off at the tip) less will be the induced drag and hence greater will be the lift . Even when the aircraft is flying below mach 1 (say around 0.8-0.9 mach) there will be areas in the plane where the flow will be accelerated and shock waves will be formed offering a lot of drag .Most of the aeronautics guides point out that one of these areas where the flow is accelerated is around the wing tips. Now the amount by which it is accelerated is directly dependent on the chord of wing tip .Lesser the chord at the tip, lesser will be the wave drag. As seen above swept wings have a smaller chord at the tip as compared to that at root and thus they prevent wave drag formation and allow for a proper flow to take place . When free stream air comes under the influence of the airfoil its velocity increases continuously from the leading edge to the maximum thickness of chord and then again decreases till the trailing edge in accordance with the continuity equation. 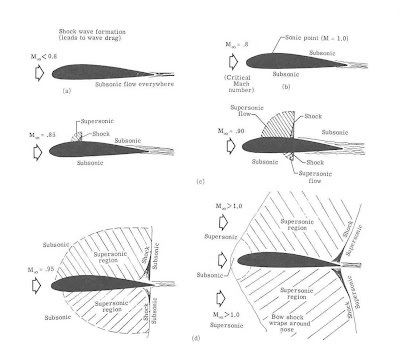 So if the flow is transonic there are chances that mach 1 speeds will be reached at maximum thickness of chord thus causing wave drag .Therefore for transonic flows the thickness of the airfoil should be reduced so that velocity at the thickest part of the chord doesn't reach sonic ranges. Actually the wave drag associated with transonic flow is directly proportional to square of chord thickness/chord length(b/l).Now swept wings are nothing but conventional wings turned through some angle therefore the length of chord is effectively increased which implies that the thickness of chord has been decreased and hence swept wings offer less drag at transonic ranges . Since in this configuration the leading edge of the wing near the root meets the air earlier as compared to the tip, during stall of the wing near the root, the tip will still be effective and so also the ailerons and thus the plane can be stabilized. There is very large amount span wise flow of vortices in swept wings from the tip to the root which stalls the total wing together. This can however be prevented using wing fences which are vertical plates on wings which prevent the span wise flow of vortex. The efficiency of these wings at subsonic speeds are low compared to that at transonic speeds .